My name is Pat. I am a WAHM of four, Grandmother of two. Our family lives on a Farm/ Nursery in South Jersey. I have been crafting, sewing, and doing needlework for many years. I did my first craft show 16 years ago. I continue to sell my crafts in local shops, on eBay, Etsy, the Handdid Market, and my website, www.ahlcoopedup.com. 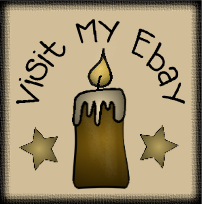 I offer handmade Raggedies, ornies, door greeters, shelf sitters, gatherings, and many seasonal Prim/Country items. Snowmen will always be my favorite! Thanks for stopping by. It's been a while since I've posted. I have been very busy crafting. My sales are growing each year. That's a good thing! I rarely keep anything that I make, but time's are changing. I couldn't let this go. I have one for sale in my Etsy shop, minus the second shoe. Just the mousie with his stocking. There is another up for auction on Ebay. I hope everyone had a blessed Thanksgiving. I had lots of family on Thursday, and Friday. I'm all turkeyed out! I can't wait to get my Christmas decorations up. I see so many of you have already started. I ordered an artificial Christmas tree for this year and my family is having fits. The kids are all out on their own, and still think they should have a say. LOL... I have a thing for over decorating my tree. Every year it droops within 3 days, and I hate it! I'm getting stubborn in my old age. The artificial tree can stay up longer, and handle my huge ornament collection. The saga will go on. I'll let you know if it's going to be the real thing, or not. I always told my kids that there was only one real Santa. I just finished 50 of these little Santa ornaments. All are sold. It's been a busy preseason. I think the one on the bottom is the "Real Santa". Hee-hee! I've been enjoying the Shameful dog photos posted on the internet. This is my version of my Sami. We have to learn to keep the downstairs bathroom door closed. She chewed up one of my little Santa's too. I have to be careful about leaving stuffed doll parts where she can reach them. Getting used to being a new doggie Mom to a beast is not as easy as I thought, but I'm in love with her. I've been busy with Christmas and Winter orders. It's crazy how fast the season comes. I just finished this lot of baby snowmen. They are all sold. I'm up to close to 100 so far. Sorry, my pictures could be better!!! LOL... I want to give a tip. I spray them with cheap hairspray, sprinkle with Glamour dust, and spray with hairspray again. It works great! Oh my, it sure has been a while since my last post. The Summer is zipping by. I've made some changes to my crafting. I started selling wholesale, and then I set up a display in the newly opened local Amish Farmers Market. I went on my usual shore/beach vacation the last two weeks in June. Sami is in Mommy's favorite chair. It sit here and do my hand work while watching T.V. It's a No-No in our house for doggies to sit on furniture. It was just so cute that I had to snap a shot! Then she got down. I just made some, or a better word "lots" of mini pumpkins. I call them jack be little pumpkins. This is a pattern by Old road primitives. I'm putting some in Vintage muffin pans, and the rest bagged up for bowl fillers. Take care, I hope to be back soon! Sid is not doing his job! The flowers are almost gone!!!! I think my slump might be over, and I'm climbing out of this funk. The first task on hand is getting a Pedicure!!! What do you think? I need one bad. My little friends don't mind one bit! I finally listed some new items on my website and etsy shop. The first is a little Patriotic Raggedy. She's one of my favorites. I'm keeping her sister for now. The next is a remake of my very popular BOO pumpkins. To get back on track with the season, I made some watermelon bowl fillers. I have some new stuff made from my own designs. I need to learn how to make e-patterns. I want to list them after my e-pattern comes out. I fear the dreaded copycats if I don't. Any help would be appreciated. Everyone have a wonderful week, and thanks for peeking at my creations and toes!!! I had four children that I love to pieces, and are my life. The best reward for having them is my Granddaughters. (I hope to have many more!). 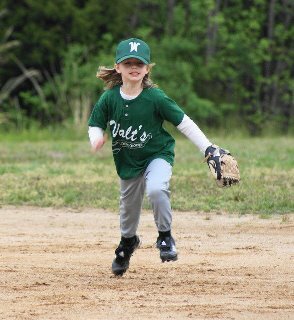 This is my 5 year old Granddaughter Grace playing in her first year of t-ball. Am I a proud Grandmother? Happy Mother's Day All!!!!!! I hope you all get to spend it with your family and loved ones!